Here we are just outside of the Eolo Lodge, which in turn is west of the town of El Calafate. The mountains in the background are the "Cordilleras," or spine of the Andes; the Chilean/Argentine border runs right along the top edge of these beauties, and that also marks the Continental Divide. On the left side of the bottom photo you can see three peaks—these are the Torres del Paine spires that we will be getting closer to (on the Chilean side) early next week. Tomorrow we will be to the right of and behind the dark hill you can see on the right side of the top photo shot, traipsing across the famous Perito Moreno Glacier. 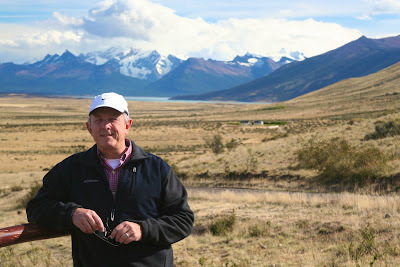 There are about a dozen glaciers that come down from these mountains, tumbling eventually into huge lakes that are only a couple of hundred feet above sea level. More pics of this tomorrow when we get back. Although this area is widely considered to be "el fin del mundo," (the end of the world) because it is so much further south than any of the other major continents (with the exception of course of Antarctica), we are still some 900 kilometers north of Tierra del Fuego, which is the southern tip of So. America. 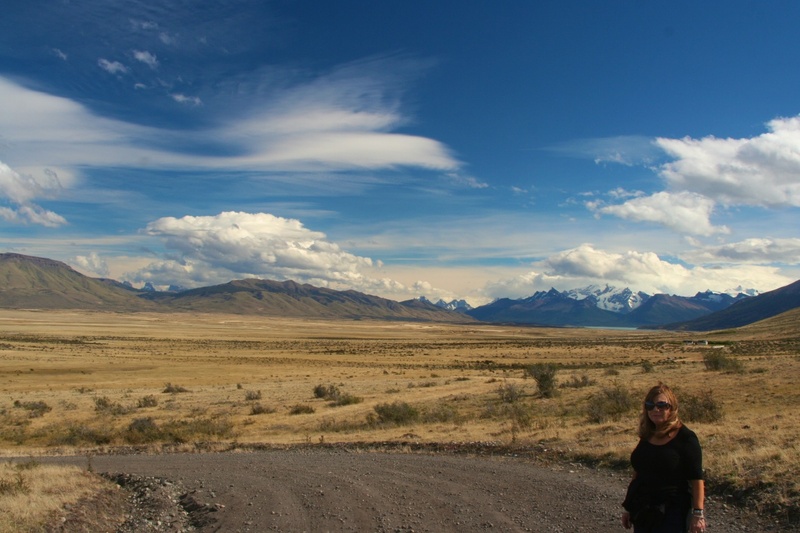 Argentina is about as long north to south as the U.S. is wide. Today we hiked down to the bottom of the valley you can see here, and found a lagoon that was filled with huge geese, eagles, and—believe it or not—pink flamingoes! I was out there in November. Amazing! Be sure to check out the glaciers!